After years of making them, I’ve very slightly tweaked the recipe (to be seriously perfect, because I’m obsessive), but the original recipe will be preserved in the notes section for all who prefer it. I’ve also taken new photos and included a how-to video, so if the page looks different to you, don’t worry, you’re still in the right place. And what a delicious place it is. Scoop 1/4 cup of cookie dough at a time and roll into balls. Then, tear the balls in half by pulling gently on both sides. Smush the two halves together again, but this time have the lumpy, torn sides face upward. Place on the prepared baking sheet, making sure the cookies have plenty of space to spread. You should be able to fit 6-8 cookies on each tray. 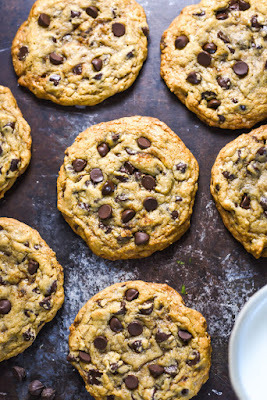 Bake for about 10-14 minutes, rotating half-way through, or until the cookies have spread out and the edges are golden, but the centers of the cookies still look soft and undercooked. Every oven is different, so I recommend starting with just one or two cookies on the tray to see what baking time works best for you! Let the cookies cool on the baking sheets until the cookies are firm enough to remove, about 15 minutes. As the cookies are cooling, press additional chocolate chips into the tops for a more bakery-style look. Repeat with remaining batches, until all cookies are baked. Enjoy with a cold glass of milk! * The original version of this recipe called for 1/2 teaspoon of salt rather than 1 teaspoon, light brown sugar rather than dark, and baking at 325°F rather than 350. I’ve found that the results are better and more reliable in the updated version, but feel free to use the old recipe if you prefer. 0 Response to "THE BEST CHEWY CAFÉ-STYLE CHOCOLATE CHIP COOKIES"